Some of the dogs waiting to go! One of the ladys going back down the trail. Me hooking up Wilo, Only and Quest. One of the ladys coming back down the trail. All the women in our last session of class, along with Wilo and Summitt in the basket of the sled. Two of the women coming back down the trail. 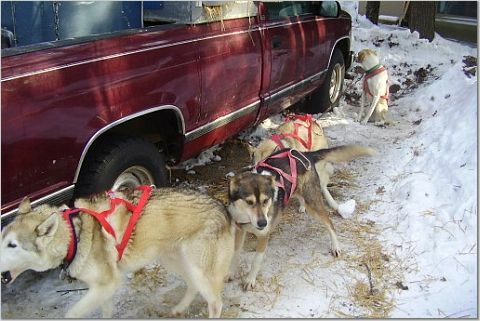 Some women waiting to help get the dogs ready to run.